I started reading the His Fair Assassin trilogy after Kinsey reviewed the first book, and since Anna reviewed the second book, it seems fitting that I review the third book. This is a fun series and I enjoyed all the books, each of which focuses on a different main character. 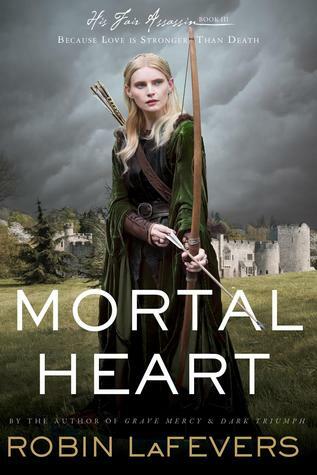 However, of the three main characters, Annith, the focus of Mortal Heart is the one I find the most annoying. For all her capabilities, she’s really extremely naïve, especially given her history. I continually reminded myself that she was just 17 and a lot of people are gullible at that age. As the book progresses and there are plots and reveals, I would routinely see the issue significantly before the main character even though we’re seeing the same evidence. I also felt a bit of a letdown at the end because I saw a potential way for one of the plot arcs to be resolved in a really fabulous way and instead it was sort of semi-resolved in an okay way. One thing I really enjoyed about this book was the look it gave into what the other eight gods of the old religion have been up to and how their chosen people are marked and what they do with them. While the grand political conflict seems to have mostly worked itself out over the course of the three books, what happens next regarding the actual convent of assassin nuns is left so very open-ended that it makes me wonder if there might be a fourth book in the planning stages. I haven’t been able to find any mention of one though. It was an okay book, but I did like the previous ones in the series a lot more. If there is a fourth book, though, I’ll definitely read it to see what happens. Kinsey recommended the first in the His Fair Assassin series, Grave Mercy, just a couple of weeks ago as a fun historical romance about deadly nuns. I was at the library when I read her post, and figured, why not? I checked it out, despite the size of the book (large), the cover of the book (beautiful girl posing melodramatically), and the inside blurb description (“For how can she deliver Death’s vengeance upon a target who, against her will, has stolen her heart?”), and I gobbled it up within the next week. It is just nonstop fun with the historical intrigue, which I liked better than Kinsey, and lots of romantic hijinx. I had a great time reading it, but wasn’t sure I was going to continue to read the series until I read the little teaser for the sequel in the back, at which point I immediately went back to the library to get the sequel. Dark Triumph follows a peripheral character introduced in Grave Mercy, another, more troubled novice of the nunnery for the God of Death. The book focuses more on the character and her past than the surrounding politics, and is thus able to make her more nuanced and interesting to follow. The two books remind me a bit of Ilona Andrew’s Edge series, where the first one is lots of fun action with somewhat generic heroine and hero, and the second one takes the more interesting side character and continues his story. While I liked Grave Mercy, I loved Dark Triumph, and literally struggled to put in down at times within the three to four days that I devoured it. So Grave Mercy is worth reading if only to then read Dark Triumph (which does not stand alone, so needs to be read sequentially). P.S. – While looking for the book cover image, I ran across the author’s website, where she has posted the first chapter of Dark Triumph, which gives an excellent preview to the book, and also does spoil Grave Mercy a bit, so use caution. Have you been thinking that there are not enough young adult novels out there about nuns who kill people in the name of the god of death? Well then, I have the book for you! But seriously, I really enjoyed Grave Mercy by Robin LaFevers, and it’s lots of fun to tell people that you’re reading about assassin nuns. Set in Brittany (now part of France) in the 1400s, the story follows Ismae, a teenage girl who is saved from an abusive father and an arranged marriage by joining a convent dedicated to Mortain, the god of death. And this convent teaches it’s novices some very specific skills, training them to be sent out into the world to kill those people marked by Mortain for death. This was clearly published in the wake of The Hunger Games and Divergent and all those other teenage dystopian future series (this is the first in what looks like a planned trilogy), and it feels very much like those books. But if you’re a little sick of dystopian futures, like I am, this offers a nice twist by being set in the past. And while there is a bit of the magic/supernatural happening with the god of death and all, it’s really mostly a historical novel about life in medieval Europe. It featured a little more political intrigue than I would have preferred (However will the Duchess keep her crown? I don’t really care all that much!) but it also had adventure, romance, and strong female characters with a lot of agency. And it sure wasn’t like anything else I’ve read lately. Kinsey’s Three Word Review: Dramatic, historical, romantic. You might also like: Scott Westerfeld’s Pretties/Uglies series. Those are set in the future, but the books felt very similar. And I consider those really fun books, so.